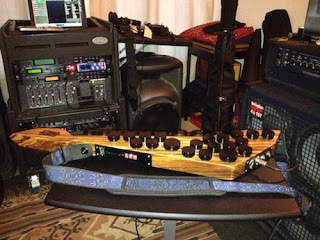 My previous blog looked at my journey from my original percussion controller, the "Drummstick", to the newest Zendrum, the "EXP". When the Zendrum EXP finally arrived, I was ecstatic, especially after having seen early photos of it posted on my facebook page. I'd already set up all of my studio gear in advance and when I was in Europe, I downloaded a copy of the updated ZenEdit, and even mapped out the EXP's trigger placements. I quickly learned that I actually needed to be more flexible, because those early set-ups didn't last very long! Everything worked great; even my wireless MIDIJet Pro performed perfectly. I'd used the settings from my Zendrum ZX as a starting point, and they translated to the EXP quite easily. One of the first things I noticed was the wonderful placement of the strap locks for me by David Haney. 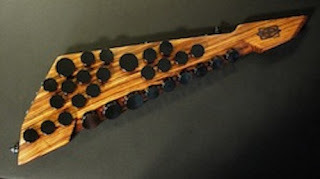 Haney knows my penchant for playing vertically, and on the model he made for co-designer John Emrich, the lock seemed to be placed lower, to accommodate Emrich's left-handed style of playing, one of the best new features of the EXP's design. Emrich appeared to play his EXP a bit horizontally, and seemed to have no difficulty in accessing the 9 triggers on the lower left side of the EXP. I however, don't play the Zendrum that way, and endeavored to use my right hand to reach those triggers. That worked for me much the same way Chapman Stick players use their right hand to reach the strings at the top of the fretboard. After a few days spent getting the EXP to perform as well as the ZX did, I still found I wasn't using the left side as much as I'd hoped. Suddenly, I'd remembered Emrich's video of the EXP, and how he switched positions to play the EXP, either sitting or standing, or by changing the way he hung the EXP on his shoulders. 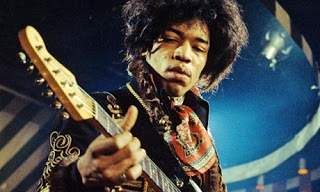 Simultaneously, I recalled a recent Washington Post article on the Jimi Henrdix Experience's rare appearance at a theater in DC, and his right-handed guitar playing. 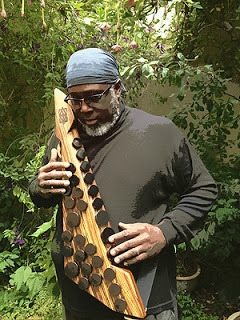 Without another thought, I quickly switched the "neck" from my left shoulder to my right shoulder ala Hendrix and voila; both hands had a full range of access to both sides of the Zendrum, just as a Chapman Stick player might; I had my vertical approach and my left hand was free to roam about the body as never before! The wonderful, serendipitous irony of Jimi Hendrix and his black Stratocaster; calling the newest Zendrum the "EXP"; my black, "Jimi Hendrix" ZX; and my experiences with both creating and playing the Drummstick had now come full circle. As soon as I reprogrammed a few of the EXP's triggers, I was truly good to go. My ability to "finger roll", and to suddenly have 29 triggers to play with, (compared to the 16 triggers of the Drummstick and the 24 triggers of the ZX), was both exciting and enlightening. All the crashes, splashes, chinas and assorted percussion that were missing before, are now part of my regular setup. I could now also trigger multiple samples and chords. There were more surprises waiting for me with EXP, like the MIDI volume control knob on the back; it was just amazing to watch the fader move on my GarageBand Pop Kit as I never had that feature on the ZX. After successfully programming and storing several kits, I was even able to recreate my composition, "The Girl of a Thousand Days"; a melodic piece I used to perform on the Drummstick with bells, vibes and chimes. The EXP's extra 13 triggers provided me with even more melodic combinations I'd never before had access to. With the EXP now functioning well, it was now time to delve into the world of ZenEdit, the software program for the Zendrum created by Darin Kadrioski. Using a Tascam US-1800 USB/MIDI interface, my first task was to download and use the latest version, (2.4.1) to backup my new EXP settings on the MacBook. ZenEdit saw the Tascam and loaded my "old school" edits from EXP perfectly. I haven't tried to load any setups from ZenEdit to the EXP yet, but with these new setups, that will be coming soon. All in all, the EXP has been a dream come true, and I'm super pleased at what Haney and Emrich have created. For me, it's the best of both worlds; It can be played vertically, or horizontally; as a melodic, or an all-world percussion instrument. The sky's the limit really; I'm about to record several projects over the coming months, while exclusively playing with the EXP in tandem with Chapman Stick, trumpet, keyboards, MIDI guitars, 7 string basses; musicians from Portugal, France and England, and music ranging from jazz to folk, rock and avant garde! The adventure indeed continues, happily now with the Zendrum EXP.